Who Are the Yankee Killers? We all know they’re out there, players who for whatever reason love hitting against the New York Yankees. It seems that nearly every year, one particular player absolutely crushes the Yankees. In 2015, the ones that come to mind immediate include Rangers 1B, Price Fielder, Orioles outfielder, Jimmy Paredes, and Blue Jays 1B Edwin Encarnacion. From current superstars to relatively unknown players, there are some players you just hate seeing at the plate against Yankees pitchers. For the purpose of this article, I focused on players currently in the league and have included their career numbers against the Yankees following my brief paragraph about them. James Loney (Rays)-James Loney is a guy who has always been a fairly solid first baseman who is a rare breed nowadays with little power, a good batting average and fantastic glove. A career .285 hitter, Loney has hit .342 with an on base percentage of .392 in 52 career games against the Yankees. Stephen Vogt (Athletics)-At the pace he’s going, Vogt is likely to find himself on this list in a few seasons. The reason I couldn’t put him over a few others is simply due to the small sample size, but at his current pace, he’s quickly becoming a Yankee killer, and a fantastic player. Prince Fielder (Rangers)-Prince is a guy that especially after looking at how good he has been against the Yankees, I was almost forced to pick him over the first baseman I decided to go with. As we know, Fielder has enjoyed success about many teams, but his OPS and overall numbers against the Yankees are ridiculous. Fielder killed the Yankees in his brief 3 game series thus far in 2015 but he also did a lot of damage against the Yankees as a Detroit Tiger. Pedro Ciriaco (Braves)-Although Ciriaco plays on the Braves, he killed the Yankees as a member of the Red Sox in 2012. Because he only faced them during that season, I can’t make him the starting shortstop but the honorable mention role suits him well. 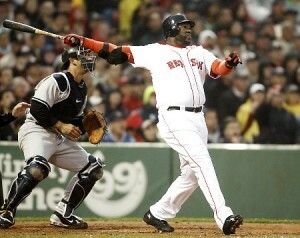 He was simply so bad against every other team but managed to hit above .400 against the Yankees. Are we even surprised? Jose Bautista (Blue Jays)-Initially, Jose Bautista was my right fielder representative, but after analyzing it, his batting average was just too low to include him in that list. Despite that, he’s enjoyed a serious power-surge against the Yankees (even more so than normal) with 26 home runs in 86 games vs. the Yankees (280 at-bats). That’s one home run roughly every 11 at-bats which is a ridiculous pace and that is why he is an honorable mention. Dustin Pedroia (Red Sox)-Dustin Pedroia could’ve easily been included as the starting second baseman of my “Yankee Killers” simply because of how long he’s been doing it. Pedroia is personally one of the few Red Sox players I can tolerate and he’s put up some great numbers against the Bronx Bombers. Jonathan Schoop (Orioles)-As opposed to Pedroia’s case, Schoop makes the honorable mention list due to his small sample size, much like Stephen Vogt. Particularly in 2014, Schoop relished facing the Yankees as he hit 4 of his 16 home runs on the season in just 15 games against the Yankees. If Schoop can sustain his success and raise his batting average, he may find his way onto the infamous “Yankee Killers” team. Catcher: J.P. Arencibia (Orioles)-When you see J.P. Arencibia on this list, the first thing you’re probably thinking is, “He plays on the Orioles?” Well – apparently so – as he is on their AAA roster. My hope is that he stays there because as a Yankee killer already, Oriole players tend to play their best against the Yankees. The main reason Arencibia makes the team is because he’s so bad against other teams (career .207 hitter with power) but he hits very well against the Yankees. As a Texas Ranger in 2014, Arencibia hit .276 with 4 home runs in only 7 games. First Base: Mike Napoli (Red Sox)-Mike Napoli just might be the second easiest Red Sox player to hate aside from David Ortiz. Unfortunately, the man rakes against New York Yankee pitching. Quite possibly my least favorite moment of last season was the top of the 9th go-ahead home run he hit off of Masahiro Tanaka to give the Red Sox the 2-1 win (forgive me for the bad memories). Below are his stellar numbers against the Yankees. Second Base: Howie Kendrick (Dodgers)- Now a Dodger, Howie Kendrick did all of his damage against the Yankees as a member of the Los Angeles Angels. 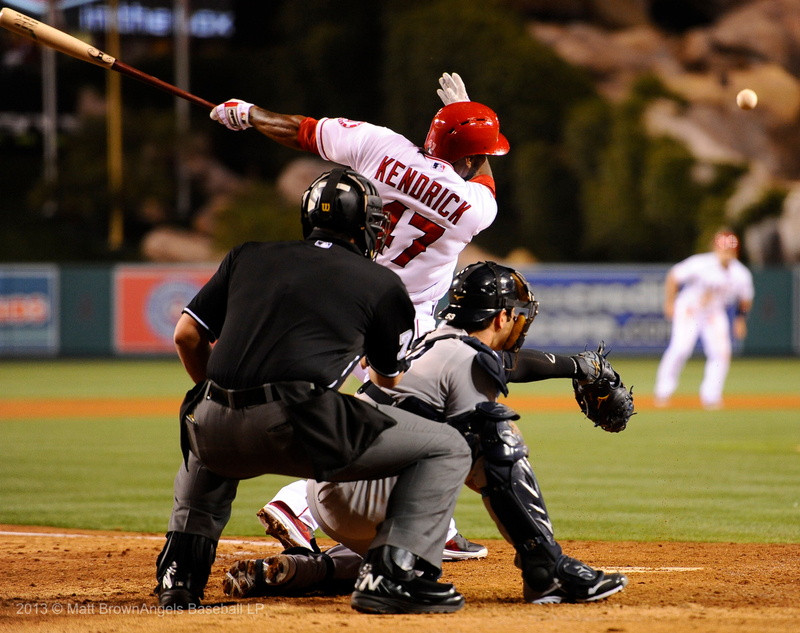 A career .292 hitter, Kendrick brought his best game against the Yankees hitting to a slash line of .342/.404/.480. Now that he’s in the National League, my hope is that we don’t see him again, unless he becomes a Yankee, which isn’t too far-fetched. Third Base: Evan Longoria (Rays)-This one was probably the easiest decision I had to make as there isn’t much sizable competition at third base as far as “Yankee Killers” go. Unless you classify Miggy as a third baseman – which he was for a portion of his career – there isn’t much argument for anyone other than Longoria. Longo has put up incredible power numbers against the Yankees as his slugging is .526. Shortstop: Alexi Ramírez-Shortstop was tough call for me due due to their being one clear-cut candiadate. It could’ve been Ciriaco, but the sample size was too small. The next closest player was Jose Reyes but an All-Star as he is, Reyes’ numbers weren’t impressive enough for him to make the cut. Ramírez has been a solid player and in a select few games against the Yankees his power numbers are up and his batting average is slightly better than his career average. 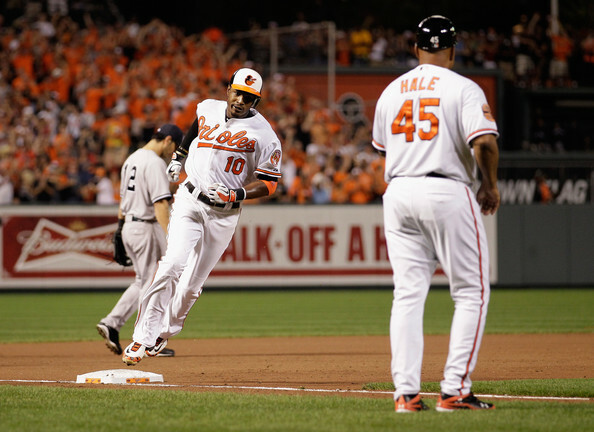 Left Field: Delmon Young (Orioles)-Delmon Young is a veteran player who hits well against the Yankees. He hits a bunch of doubles and seems to always come up clutch against the Yankees. With a .309 average against the Yankees compared to a .284 career average, it is clear the Young loves playing the Yankees. Center Field: Adam Jones (Orioles)-When I looked at Adam Jones’ career numbers, I was pretty surprised at how unimpressive they were. Then I began looking back at all the times he’s hit a clutch home run or come up huge defensively for the Orioles against the Yankees and that made my decision easier. Although Jones’ numbers aren’t overly impressive especially compared to his career numbers, he does a myriad number of positive things for his team and is a Yankee killer due to that. Right Field: Mark Trumbo (Diamondbacks)-Now a member of the Arizona Diamondbacks, Trumbo and Kendrick feasted off of Yankee pitchers as members of the Angels. Trumbo posts an incredible 1.024 career OPS against the Yankees compared to it being just .764 for his career. He hits a home run every 3rd game against the Yankees but I’m content that we probably won’t ever see much more of him. Designated Hitter: David Ortiz (Red Sox)-This one was without a doubt the easiest of all, partially due to the lack of competition at DH but also due to the fact that David Ortiz is seen in every Yankee fan’s nightmares. Although I can’t stand him, Ortiz is one of the more clutch hitters of his time and that couldn’t be truer against the Yankees. I don’t need to say much more about Ortiz, his eye depressing numbers against the Yankees are below. Best Overall: Miguel Cabrera (Tigers)-Miggy wins the best overall award because he crushes every team – including the Yankees. Although he wasn’t impressive in the 2003 World Series, he was just a rookie and came back with a vengeance against the Yankees in the 2012 ALCS (more bad memories). Yes, he is a killer of every team and that is why he wins best overall. His stats against the Yankees are below. Well, that wraps up the “Yankee Killers” list. I feel like I was fair to all divisions although most of the anti-Yankees play in the AL East simply because they receive more exposure to Yankee pitching. Is there anyone you feel I left off? Leave the name of the player and why in the comments! Follow the @BronxBomberBlog on twitter for more Yankees updates, news, analysis, live tweets, humor and all things Yankees!